Oh this weather is difficult. Blowing hot and cold, rain and shine - you and your outfits just don't know where you are from one minute to the next. 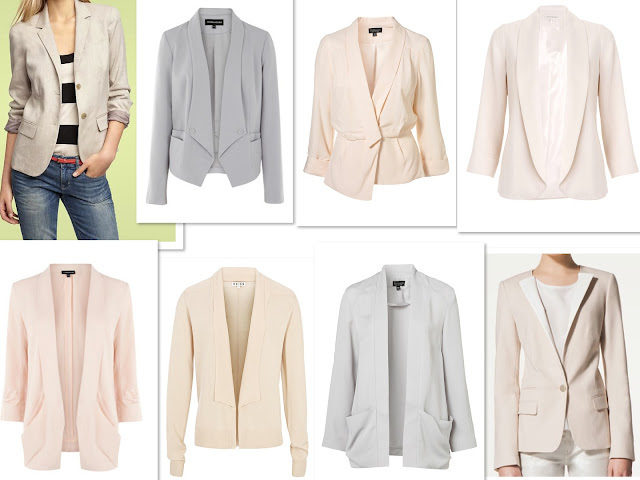 So this is where the neutral jacket steps in - a wardrobe heroine, if you like. I like. It goes with pretty much any outfit, and is a useful layering piece. Casual enough to put on a parka over the top, plus a couple of fine layers underneath. And smart enough to wear at the office or in the evening. Pile on the jewellery if you need to dress it up, and sling on a shawl if you need to warm it up. Here's a high-street selection - there's a good choice out there. Look for a good fabric and don't be put off by cheap or naff looking buttons - you can change them in a few minutes. Also, you'll find yourself wearing one of these jackets so much that looking for one that can be machine washed is a time and money saver.